Rūtų 21 means an exclusive life style and maximum privacy, high efficiency engineering solutions and natural materials, modern urban trends featuring architecture of the building and pronounced visual prevalence of the surrounding environment. A building with 7 luxurious apartments has been professionally designed for a person of exquisite taste who deserves maximum comfort and security. The building is found in Antakalnis residential area next to the Sapieha Palace surrounded by centenary pines. 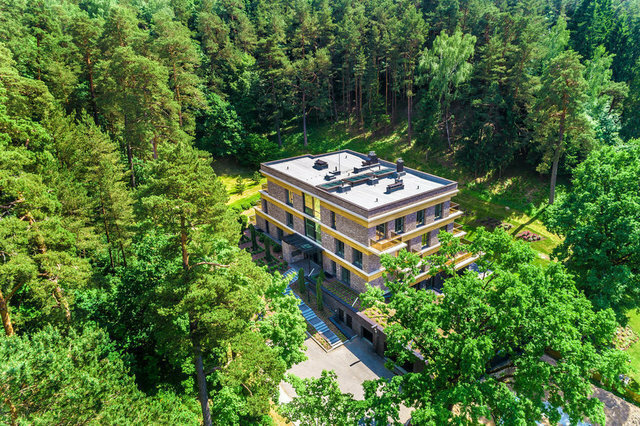 Rūtų 21 is located at a few minutes distance to the city centre which is bursting with life and at the same time it is filled with harmony and the sense of completeness conveyed by enchanting views of nature. It is a perfect place for families: schools, universities and health care institutions can be found in the vicinity. Energetic persons will appreciate fitness trails, cycling paths, and cross-country skiing trails. The building has terraces which descend towards the slopes of the park and open the view to the surrounding pine forest thus creating a unique feeling of privacy in every apartment of the building. Direct exits installed on the lower floor lead to individual recreation courtyards separated by green plantations. Spacious, naturally illuminated lobby, non-standard height of the premises and particularly luxurious finishes as well as precise quality of work help the building convey the impression of articulate representativeness. To ensure residents’ security a modern building security system has been installed which recognises the master of the apartment. The building has been rated class A in terms of energy efficiency. The construction materials used in the building heat the premises passively and stabilise the temperature in the premises. Geothermal heating and heat recovery ventilation (also called recuperation) equipment guarantee fresh air of the premises and comfortable temperature at all times. Big windows ensure abundant natural light in the building. The underground parking lot contains 18 spaces for cars and motorcycles, it also has a charging station for electric vehicles. The basement features spacious storage rooms and a storage room for bicycles. There is also a spacious visitor or guest parking lot next to the building.